Posted <2017-03-26 Sun 23:45> by Aaron S. Jackson. I recently saw a photo of a HP 95LX and it triggered something inside my brain that makes me want something similar. Look at it! It is small and has all the necessary keys. Shift, control and alt. Perfect for Emacs. Unfortunately, it is ancient, which while appealing to me in a different way, isn't very helpful. It is also very slow and has only half a MB of RAM. Preferably half a GB of RAM or more. A recent successfully funded project on Indigogo is the "GPD Pocket". It looks awesome. It's small, has the right buttons and it is capable of running Linux. It does have WiFi, but not a 3G modem. Tethering will just become a hassle. I just want to be able to put a SIM inside it and have it connected to the network continuously. So, the lack of 3G modem, and the steep price, makes me think this isn't the right option. It's close though. I mainly want it for opening SSH connections and running Emacs, so a decent screen isn't even necessary. It would actually be better if it could boot only into text-mode, since that would save space and be less distracting. How about the Nokia N900? It runs Linux by default, and is generally pretty neat. It reminds me a little of my old Windows Mobile HTC TyTN 2. The only bad thing about the N900 is the lack of the alt key, although maybe a different key can be bound to alt.. I am may be willing to compromise, but only if I can't find anything better. So far I am still not convinced that this is the case. Oh well, enough thinking. Time for bed. 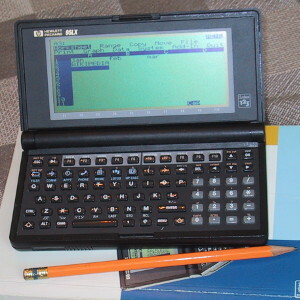 The photo of the HP 95LX was taken from Wikipedia.